Cartwright Gardens lies in the far east corner of Bloomsbury, somewhat south of the dreary Euston Road, and somewhat north of the still drearier quarter that fringes on the western confines of Clerkenwell. Whoever knows nothing of it and goes thither on a voyage of discovery must not expect what the name, taken literally, would seem to suggest – here are neither bushes not brakes, flowers nor fruits. What is here is a drab and dismal crescent of houses, fronted by an enclosure wherein soot and grime descend on the London plane tree and the London turf; an oasis, perhaps, in the surrounding wilderness of shabby streets, but only, as things go, for the brave sparrow and his restless stalker, the lodging-house cat. In foregrounding spatiality, both in the title and the text’s opening set-piece, ‘Golden Age’ popular detective fiction writer J. S. Fletcher was partly following a formula that had proved successful for him in the past. He had come to fame in the previous decade with The Middle Temple Murder (1918) and had very recently published The Charing Cross Mystery (1923), both of which novels made explicit use of recognisable metropolitan locations in order to accentuate a sense of topicality and urgency. In this practice he was, of course, hardly original, as the prominent use of real London places in detective fiction had become common by this point in the development of the genre and can be traced back at least as far as that pioneering pot-boiler, The Notting Hill Mystery (1862-3). Part of the repertoire of tricks writers could employ to achieve the ‘reality effect’ Roland Barthes has discussed, branding one’s fiction with an actual residential address was a way of linking it in the reader’s imagination with the crime columns of newspapers, which similarly christened unsolved crimes with recourse to the Post Office Directory. What is curious and notable, however, about the book’s prominent geography is the fact that the very street spotlighted in Fletcher’s novel had featured in those newspaper columns, albeit fifty years earlier. In 1878, it had played host to the shocking homicide of an elderly widow, Rachel Samuel. An unsolved crime sensation, the case was known popularly with reference to the then current name of the street as the ‘Burton Crescent murder’. The renaming of Burton Crescent, which was almost certainly prosecuted partly in response to the reputational corrosion the locality sustained because of the unsolved crime with which it was associated, happened as late as 1908. While the bricks and mortar of the street itself had been laid down between 1809 and 1820 by the speculative master builder James Burton (after whom it would take its original name), its latter designation ‘Cartwright Gardens’ was only sixteen years old when the novel appeared. When we pay attention to the novel’s intertextuality with the geography of other earlier and more famous texts, the old street name appears to have been intentionally (if subtly) invoked. In Anthony Trollope’s The Small House at Allington (1864), the ‘hobbledehoy’ hero of that novel Johnny Eames also rents a room in a boarding house on Burton Crescent (as it was then called). Like Albert Jennison, Eames is in his early twenties and a fellow of imaginative or even poetic propensities (a ‘builder of castles in the air’). Both leave their lodgings in this street behind and move, initially, to the Great Western Hotel, in Paddington. That detail of residential trajectory is surely too precise to be unmeaning coincidence. It suggests Fletcher was aware of Trollope’s novel (and of the old street name) when writing his own text set in the same geographical location. A number of theorists of space have seen something rather fascinating and complex in place names. Georg Simmel finds the shift from names to numbers in the modern city a phenomenon that illustrates the move towards ever greater efficiency (and consequent alienation) that occurs in industrialised modernity. Walter Benjamin and Michel de Certeau, meanwhile, are both interested in what escapes that shift away from messy particularity. The former thinks about the poetic ‘magic’ that occurs in the chance encounter between two names formed by a street corner, while the latter explores how the imposed significances inscribed by planners on the streets they design or rename become broken up, subverted, and rewritten by the everyday poetic practices of talkers and walkers. By ghoulishly reviving the memory of a repressed past by staging another murder there, and by pointing the (careful and thorough) reader, through allusion to local literary history, to the old tainted street name, Fletcher’s novel might be seen to enact another related kind of subversive local practice to those de Certeau envisions. Rather than opposing a top-down scripturality with an alternative semantics of street-level resistance that is carried through oral and spatial manoeuvres, The Cartwright Gardens Mystery coaxes out the spectre of the old name from beneath the new through the play of submerged intertextuality and genre. J. S. Fletcher, The Cartwright Gardens Mystery (London: W. Collins, 1924) p1. Alexander Regier, ‘The Magic of the Corner: Walter Benjamin and Street Names’ The Germanic Review: Literature, Culture, Theory, Volume 85, Issue 3, 2010. pages 189-204. Michel de Certeau, The Practice of Everyday Life (1984, 103-5). In my work, I’m pretty committed to trying to get my research ‘out there’ as much as possible, and have experimented with a fair few different kinds of dissemination in the past few years, including doing walking tours about William Morris, speaking to a residents association for the Brunswick Square and Brunswick Centre neighbourhood about its locality literary history, recording podcasts about the writer as resident, and, of course, this blog (a relatively new medium for me). Of all the varieties of what is tediously reified by managerial types as ‘public engagement’ I’ve been involved in, certainly the oddest, most nerve-wracking and also most enjoyable has been academic stand-up comedy, an innovation Steve Cross at UCL introduced me to, through its pretty awesome Bright Club. Having previously done routines for them about nineteenth-century Bloomsbury (I hear you yawn!) and the houses of parliament burning down (more exciting, yes? ), they’ve asked me to participate in one event that I just couldn’t afford to turn down. This Sunday afternoon, I’ll be joining a cross-disciplinary bunch of other academics that will (hopefully) amuse and inform the public about intoxicants. Anyone that knows me even slightly will agree that, for once, at least, I can claim to be expert on something…. I’ve chosen to do a talk on the use and cultural representation of opioids in the nineteenth century, a topic I’ve become interested in largely through my research into the poetry of George Crabbe, a clergyman writer who was also (perhaps not coincidentally), addicted to laudanum for much of his life. Laudanum, that ubiquitous cure-all made of alcohol and opium, was extremely widely available throughout the Romantic and Victorian periods. Crabbe, who is best known for writing ‘Peter Grimes’ (1810), a poem set in Aldeburgh which Benjamin Britten would make famous through his glorious opera of the same name, was by no means alone in forming a life-long habit after being prescribed the medicine for a relatively minor ailment. Another writer a couple of generations after him, Wilkie Collins also became hooked on the stuff, and wrote it into the plots of some of his sensation novels, including most famously, The Moonstone (1868). One of his earlier novels, which was serialised in Dickens’s All the Year Round between March 1862 and the beginning of 1863, No Name also features a protracted scene that revolves around this potentially lethal but also very commonplace nineteenth century intoxicant. The thing that really intrigues me about this novel’s use of laudanum is – as so often in my work – the matter of space and geography. For where does Collins choose to set the novel’s thrilling laudanum scene but Aldeburgh. I haven’t yet been able to find out whether Collins did or could have known about Crabbe’s addiction – haven’t had time to track down the relevant books yet, sorry! But what we might call a kind of intertextuality of literary geography always jumps out at me when I read texts that inscribe a new story on an already culturally mediated site: so often, when writers engage with a place in their fiction, they call up the memory of other contemporary or previous writers that have become associated with that place in their own work. Much of my research into nineteenth-century Bloomsbury involved tracking down these shadowy references to the cultural constructions of the place from the literature of a few decades back, as for instance does my chapter about the intertextual relation of the geography of Thackeray’s Vanity Fair to its silver fork antecedents. When I read this novel by Collins, the lengthy section set in Aldeburgh kept reminding me of passages I knew from Crabbe’s masterpiece The Borough (1810), of which ‘Peter Grimes’ forms a part. When I came across the scene in which the mentally disturbed heroine Magdalen Vanstone contemplates suicide by laudanum overdose, it appeared to directly invoke the spirit of Crabbe, a poet whose tragic verse includes non-heroic ‘self-murder’ with notable and unusual frequency. Leaving that unsolved question of the intentionality or otherwise of the spatial intertexuality between Crabbe and Collins, in my stand-up routine I’m going to play it for laughs. Contemplated suicide, should, of course, be no laughing matter, and in the case of No Name this is, in one sense, very much the case. Magdalen’s long night of toying with killing herself is a highly powerful and emotional piece of writing, which can be, even now, very moving. But, as so often happens with Victorian fiction, there is an element of farce that lies behind the sentiment. (One is reminded of Oscar Wilde’s famous quip about Little Nell’s exit stage right.) 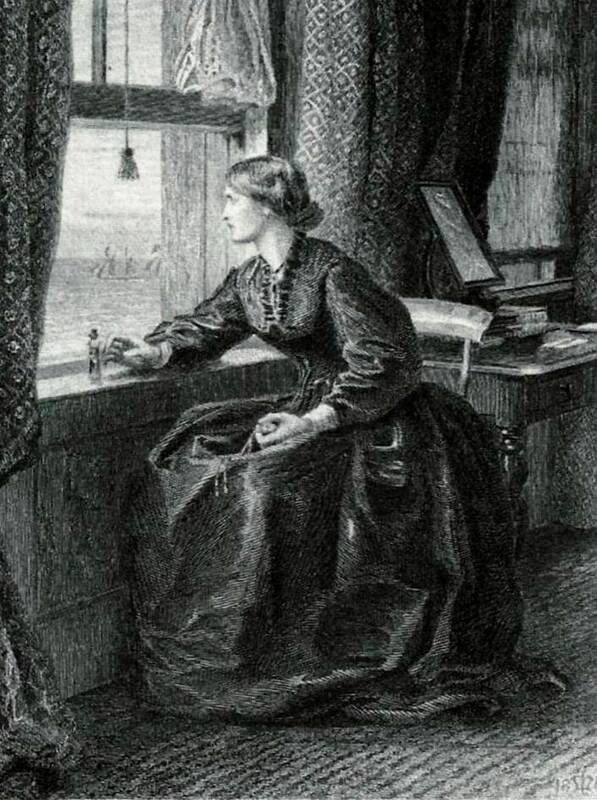 In what seems to me, when one reads it in the cold light of one’s office, a preposterous plot scenario, Magdalen decides to give her fate up to the gods by playing ‘eeny-miny-mo’ with the ships on the sea that pass by her window within a strictly timed thirty minutes. Psychologically acute or absurdly contrived, bearing in mind, we know all along Collins can’t afford to lose his beautiful heroine: you decide! The sea showed it to her. Dimly distinguishable through the mist, she saw a little fleet of coasting-vessels slowly drifting toward the house, all following the same direction with the favoring set of the tide. In half an hour—perhaps in less—the fleet would have passed her window. The hands of her watch pointed to four o’clock. She seated herself close at the side of the window, with her back toward the quarter from which the vessels were drifting down on her—with the poison placed on the window-sill and the watch on her lap. For one half-hour to come she determined to wait there and count the vessels as they went by. If in that time an even number passed her, the sign given should be a sign to live. If the uneven number prevailed, the end should be Death. With that final resolution, she rested her head against the window and waited for the ships to pass. The first came, high, dark and near in the mist, gliding silently over the silent sea. An interval—and the second followed, with the third close after it. Another interval, longer and longer drawn out—and nothing passed. She looked at her watch. Twelve minutes, and three ships. Three. She looked at her watch again. Nineteen minutes, and five ships. Twenty minutes. Twenty-one, two, three—and no sixth vessel. Twenty-four, and the sixth came by. Twenty-five, twenty-six, twenty-seven, twenty-eight, and the next uneven number—the fatal Seven—glided into view. Two minutes to the end of the half-hour. And seven ships. Twenty-nine, and nothing followed in the wake of the seventh ship. The minute-hand of the watch moved on half-way to thirty, and still the white heaving sea was a misty blank. Without moving her head from the window, she took the poison in one hand, and raised the watch in the other. As the quick seconds counted each other out, her eyes, as quick as they, looked from the watch to the sea, from the sea to the watch—looked for the last time at the sea—and saw the EIGHTH ship. She never moved, she never spoke. The death of thought, the death of feeling, seemed to have come to her already. She put back the poison mechanically on the ledge of the window and watched, as in a dream, the ship gliding smoothly on its silent way—gliding till it melted dimly into shadow—gliding till it was lost in the mist. The strain on her mind relaxed when the Messenger of Life had passed from her sight. Her eyes closed, and her head fell back. When the sense of life returned to her, the morning sun was warm on her face—the blue heaven looked down on her—and the sea was a sea of gold. She fell on her knees at the window and burst into tears. As a couple of my previous posts have related, I’m currently writing a new chapter for my monograph on nineteenth-century Bloomsbury that addresses the social and cultural space of the boarding house. A number of fictional representations of Bloomsbury boarding houses appear between the 1830s and the 1880s, which, building very clearly on from one another, allow for the development of kinds of realism that were quite unfamiliar in other more conventional narrative spaces. One particular room stands out within cultural discourse upon the boarding house for the way it seems to provoke especial anxiety (or, indeed, subversive delight) on the part of writers, because it accentuates the social hybridity temporary accommodation heralds more broadly: the parlour or drawing room. When Trollope and Gissing make use of the Bloomsbury boarding house in order to produce innovations in realism, they draw specific inspiration from these reception rooms, finding in them an enhanced social precariousness that crystallises the broader spatial phenomenon they exemplify. Returning to the boarding house, what happens when the already complex social space of the ideal family home’s drawing room or parlour is wrenched from its domestic setting and re-inserted into the worryingly hybrid, fluid, even contingent mess that was multiple occupancy accommodation? For one thing, the dialogic qualities Heil discerns are amplified, and the social conflicts she discusses in terms of gender are complicated by the very distinctive additional presence of class difference. In short, the boarding house parlour or drawing room is ‘charged with [still more] infinite possibilities for the making and breaking of relationships’, in that the social mix of characters it enables tends to even more subversive levels of potential equality. If parlours in general are dialogic spaces (as the etymology, from the old French, ‘to speak’, insists), boarding house parlours enable a still more (apparently) anarchic discourse to take place. Gathered together in one space from all over the city, nation or empire, and representative of different classes and genders, the boarders metaphorically cross borders (if you will) when they engage in conversation in the boarding house parlour. It is the social permeability of these spaces that attracted writers such as Dickens, Trollope and Gissing, who wanted to energise their plots with something new, and in the process, took realism further than it had gone before. In my readings of episodes from Dickens, Trollope and Gissing that occur in the parlours and drawing rooms of Bloomsbury’s boarding houses, I connect the materiality of that oozing ‘through the folding-doors’ with the social and cultural blending and blurring these spaces allowed. At the recent BAVS (British Association of Victorian Studies) conference, whose theme was ‘Victorian Sustainability’, I addressed the participation of nineteenth-century fiction in the discourse upon the unplanned horizontal expansion of cities, which led to the coining, in 1955 (according to OED) of the now dead metaphor of ‘sprawl’. Over the course of the Victorian period, the rhetoric through which writers rendered urban sprawl changes, the construction of new suburban houses becoming increasingly construed in terms of natural reproduction, incubation, and germination, whereas it had been largely described before that by way of the analogy of war, conquest or empire. The key decade for this transition appears to have been the 1860s, when both Dickens and Collins, who had written about the subject in earlier novels, newly engage with sprawl in a way that is suggestive of biological kinds of growth and multiplication, and not simply social (and therefore reversible) kinds. In the larger version of the paper, I show how this shift towards the biological becomes more pronounced towards the end of the century, and argue that when we engage with the idea of ‘sprawl’, we should be aware both of the complex cultural historical roots of the metaphor and of the negative implications for the environmental movement of using a concept with its ‘roots’ (ahem) in biologistic conceptions. Whereas, from the 1830s to the 1850s, the growth of the city was frequently imagined in terms of war or imperial takeover, from the 1860s on, more biological images of organic change creep into sprawl fiction, through gestures to natural reproduction and to the figure of the child. 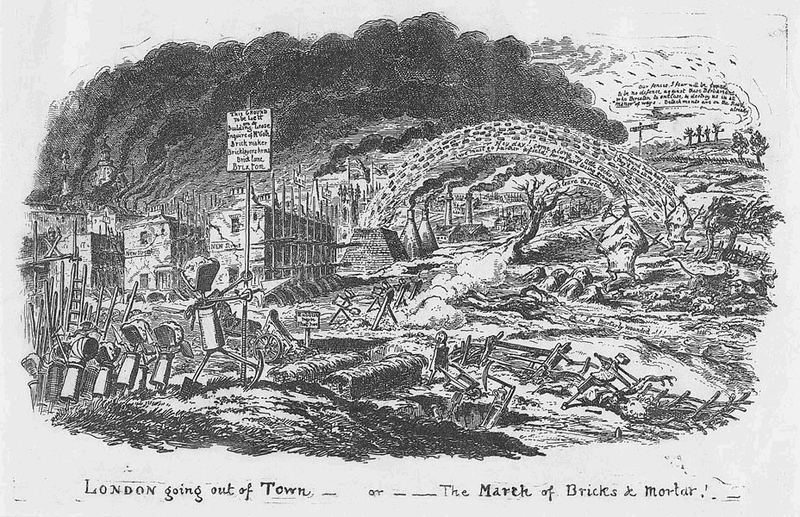 ‘The March of Bricks and Mortar’ (1829), by Dickens’s great illustrator Cruikshank, was influential in establishing an association of urban sprawl with a kind of battle, or conquest, and a number of articles and pieces from 30s and 40s make similar kinds of analogy; even as late as Bulwer Lytton’s What Will He Do With It? published in 1859, we can see the shadow of the battle idea playing itself out, in its description of new North London suburbia, where each ‘encamped’ tenement is ‘tortured into contrast with’ its neighbours, most of whom (Pharoahs, Spartan, Normans, Goths) are past warmongers. …one of those new dwellings which yearly spring up north of the Regent’s Park [formerly in Middlesex] – dwellings that, attesting the eccentricity of the national character, task the fancy of the architect and the gravity of the beholder – each tenement so tortured into contrast with the other, that, on one little rood of ground, all ages seemed blended, and all races encamped. No. 1 is an Egyptian tomb! – Pharaohs may repose there! No. 2 is a Swiss chalet – William Tell may be shooting in its garden! Lo! The severity of Doric columns – Sparta is before you! Behold that Gothic porch – you are rapt to the Norman days! Ha! those Elizabethan mullions – Sidney and Raleigh, rise again! The schools were newly built, and there were so many like them all over the country, that one might have thought the whole were but one restless edifice with the locomotive gift of Aladdin’s palace. They were in a neighbourhood which looked like a toy neighbourhood taken in blocks out of a box by a child of particularly incoherent mind, and set up anyhow; here, one side of a new street; there, a large solitary public-house, facing nowhere; here, another unfinished street already in ruins; there, a church; here, an immense new warehouse; there, a dilapidated old country villa: then, a medley of black ditch, sparkling cucumber-frame, rank field, richly cultivated kitchen-garden, brick viaduct, arch-spanned canal, and disorder of frowziness and fog. As if the child had given the table a kick and gone to sleep. In Armadale (1866), meanwhile, Collins uses building plots for a scene of classic suspense, which invokes not a sense of visible brutish aggression but instead a pervasive sense of decay. The streets dwindled feebly….into smaller and smaller houses, and died away on the barren open ground into an atrophy of skeleton cottages. Builders hereabouts appeared to have universally abandoned their work in the first stage of creation. Landowners set up poles on lost patches of ground; and, plaintively advertising that they were to be let for building, raised sickly little crops meanwhile, in despair of finding a purchaser to deal with. ….in the dim light, I saw the half-completed foundations of new houses in their first stage of existence. There is a foreboding in the writing of this scene of a different register to the earlier novels. The jocular satire, lengthy lists and elaborate military conceits of Dickens, Bulwer, and the early Collins, have been replaced by the pan-around camera view, noting with a sense of wary distance all that is in sight. The fictional technique anticipates the language of cinema, and the uneasy glance at those ‘gaunt scaffolding poles’ reminds one of that moment in Ridley Scott’s film Alien (1979) when the protagonist Kane first surveys all those slimy eggs waiting to be hatched. Similar to the worryingly quiet bits of other horror films, the horror of this building plot is that of insidiousness, of the gradual and therefore virtually unnoticeable creep. When one looks at it square in the face, it appears so dead, so static, so bereft of animate industry, being ‘waste ground’, with all that phrase’s connotations of oblivion, futility, lack. Come back another day, however, and it will have been transformed into a ‘bran-new’ part of suburbia. The building plot, meanwhile, with its messy paraphernalia of scaffolding and scattered bits of un-built houses, will have sidestepped into the next field. At the beginning of the twentieth century, a number of thinkers turned to the city to analyse and theorise specifically urban forms of everyday life. Figures such as Georg Simmel and Walter Benjamin attempted to think through and generalise about the way people were currently living in the most modern of cities.This incursion of the messily topical into the intellectual arena can be claimed, to a great extent, as the beginnings of critical social science. But this early point of urban studies also has a prehistory in the work of nineteenth-century writers who, in a less rigorous way and within more popular genres, had responded to the same phenomena. This is not a prehistory Benjamin at least would have wanted to downplay: much of his work relies explicitly on the imaginative energies of writers from the 1800s, such as his influential material on the flâneur, which draws heavily on the poetry of Baudelaire and a short story by Edgar Allan Poe, ‘The Man in the Crowd’ (1839). Moving through…traffic involves the individual in a series of shocks and collisions. At dangerous intersections, nervous impulses flow through him in rapid succession, like the energy from a battery. Bauderlaire speaks of a man who plunges into a crowd as into a reservoir of electric energy. Circumscribing the experience of the shock, he calls the man a ‘kaleidoscope equipped with consciousness.’ Whereas Poe’s passers-by cast glances in all directions which still appeared to be aimless, today’s pedestrians are obliged to do so in order to keep abreast of traffic signals. Thus technology has subjected the human sensorium to a complex kind of training. What emerges strongly from this passage is the growing threat in urban modernity of collision, and also the development of a new mode of living that is forged in direct relation to this threat. The new pedestrian is conditioned by new taboos that are experienced as ‘nervous impulses’ flowing like some electrical current at the ‘dangerous intersections’ where the horrific possibility of collision comes most vividly into play. But if we return to Poe’s fiction, not all of his passers-by are as relaxed or ‘aimless’ in the glances that they cast as Benjamin implies. In another of his stories that is also, not coincidentally, one of the initiators of the detective-writing tradition, Poe demonstrates an interest in collisions in the city that suggests he intuits their symptomatic identity in the emergent modernity to which his fiction responds. In ‘The Murders in the Rue Morgue’ (1841), the proto-detective Auguste Dupin is indulging in a spot of night-walking in Paris with his friend, the narrator, when the former vocalizes a comment upon the latter’s un-vocalized train of thought, provoking the astonished companion to ask him to explain what appears on the surface to be the exercise of supernatural powers. Dupin obliges by narrating a complicated trajectory of deduction, combining optical and auditory observation, and also linking up the contours of their previous conversations with minor everyday events in which they recently participated in their physical journey through space to the present place and moment in time. I now remembered that, in fact, a fruiterer, carrying upon his head a large basket of apples, had nearly thrown me down, by accident, as we passed from the Rue C___ into the thoroughfare where we stood; but what this had to do with Chantilly I could not possibly understand. Although the narrator has already forgotten the collision, Dupin, the pioneer, the prophet of modernity, realises that something momentous and formative has occurred. Poe’s fiction offers no elaboration of the centrality of collision taboo to the operation of the modern city, but by placing such an ‘accident’ so prominently before his readers, as an agent of thought for the un-reflexive pedestrian and an object of thought to the analyst, ‘The Murders in the Rue Morgue’ gestures towards the significance Benjamin would later illuminate. “Well, it was this way,” returned Mr. Enfield: “I was coming home from some place at the end of the world, about three o’clock of a black winter morning, and my way lay through a part of town where there was literally nothing to be seen but lamps. Street after street, and all the folks asleep—street after street, all lighted up as if for a procession and all as empty as a church—till at last I got into that state of mind when a man listens and listens and begins to long for the sight of a policeman. All at once, I saw two figures: one a little man who was stumping along eastward at a good walk, and the other a girl of maybe eight or ten who was running as hard as she was able down a cross street. Well, sir, the two ran into one another naturally enough at the corner; and then came the horrible part of the thing; for the man trampled calmly over the child’s body and left her screaming on the ground. It sounds nothing to hear, but it was hellish to see. It wasn’t like a man; it was like some damned Juggernaut. Beyond the asymmetry of the two figures colliding and the asymmetric physical injuries caused by such a meeting between a small child ‘running…hard’ and a little man ‘stumping along…at a good walk’, the really ‘horrible’ or ‘hellish’ feature of this episode – its uncanny quality – is the calmness with which Hyde tramples over the body. It is the intentionality of this street accident, deliberately transgressing as it does the collision taboo, that unveils this character as the embodiment of the urban Gothic. ‘The Bohemian in Bloomsbury’. Saturday review of politics, literature, science and art. Sep 17, 1904. When Virginia Stephen (better known by her married name, Woolf) moved into Bloomsbury, in 1904, at the very beginning of her writing career, the area had a long and rich history in cultural representation, though one characterised by denigration more than celebration. As the passage from a contemporaneously published piece bucking that trend suggests, despite (or rather, because of) its ‘banality’, ‘vulgarity’ and ‘sordidness’, generations of writers had trodden ‘upon the shoulders’ of the ‘unfortunate region’, gaining inspiration from its peculiar qualities – even to the extent that the ‘more sensitive of its inhabitants’ had taken to disavowing the tainted name in their address entirely. Nowadays, the name of Bloomsbury is more likely to invoke different connotations within the popular imagination – of wealthy intellectuals living in each others pockets; of the Bells, John Maynard Keynes, Duncan Grant, and the Woolfs themselves, the very antitheses of banality and vulgarity, we might think (if not, for the prudish, sordidness!) 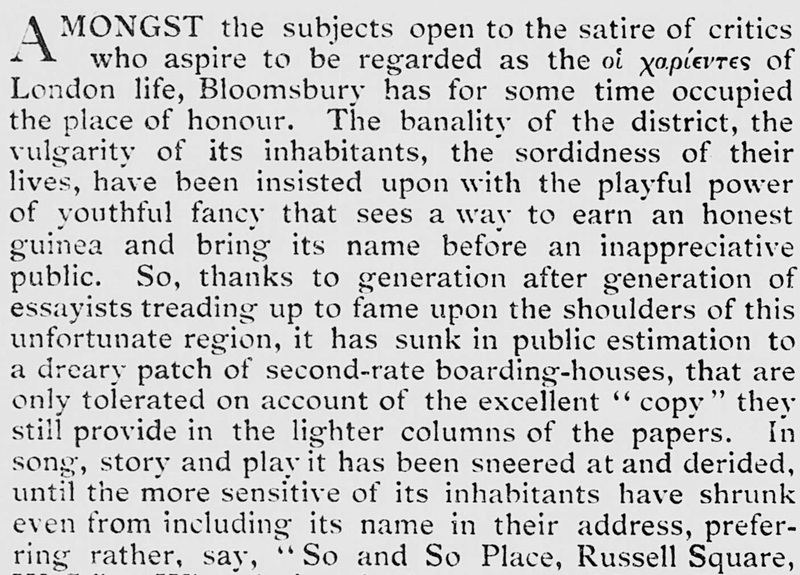 But the Bloomsbury that attracted this famous coterie at the beginning of the twentieth century was precisely that described in the passage above, and the ‘dreary patch of second-rate boarding houses’ described by the Saturday Review is, more or less, the same one Woolf herself constructed in Mrs Dalloway (1925), when she housed Septimus Warren Smith in cheap temporary accommodation there. Far from a site of transcendence from the tedious mess of material reality, Bloomsbury was in 1904 (as it was for much of the nineteenth century) a space associated with the real, at its most ‘dreary’ or, indeed, embarrassing. One key strand of my research concerns the relationship between cultural constructions of gender (broadly conceived) and the social production of space in the long nineteenth century. Hence, as earlier blog posts demonstrate, when I consider sites such as the boarding house, I foreground the way writers such as Dickens play with contemporaneous ideals about marriage through their innovative fictionalizations of this particular geography. In a related vein, there’s an article of mine published in Nineteenth Century Gender Studies that looks at the way stereotypes of domestic masculinity were deployed in the 1850s and 1860s, by authors including Edward Bulwer Lytton and Mary Elizabeth Braddon, to perform an apparently different form of cultural work entirely: the clarification (or ‘zoning’) of the bourgeois centre of London into residential west and commercial east. In my reading of the geographical work of the Victorian novel, representations of gender frequently occur hand in hand with representations of space, drawing energy symbiotically one from the other. I’m set to give a related paper at BAVS (British Association of Victorian Studies) in September about the way anxieties about natural reproduction are carried through narrative depictions of urban sprawl. Developing an earlier interest of mine in the ways in which nineteenth-century serial novelists related to the figure of the speculative builder, (conceiving of half-finished suburban streets as analogous to their own speculative publishing projects), I want to explore in this paper how, in the last few decades of the century, the discourse upon the ‘jerry built’ suburbs at the edge of London was suffused with nightmarish figures of abandoned, aborted, or otherwise surplus-to-requirements children from post-Malthusian and social Darwinian imaginaries. Two bricklayers are building a yellow brick wall to the rear of one of a terrace of new jerry-built houses in a genteel suburb. At their back is the remains of a grand old garden. Only the unexpired lease saves it from the clutch of the speculator. An apple-tree is in full blossom, and a fine elm is lying on the grass, sawn down, as it stood on the boundary of a ‘desirable lot’; many fair shrubs crop up in unexpected places, a daphne-mezereum struggles to redden berries amid a heap of refuse thrown out by the caretakers; a granite urn, portions of a deftly carven shield, a mailed hand and a knight’s casque, relics of some fine old house demolished to accommodate the ever increasing number of the genteel, lie in the trampled grass. The road in front is scarcely begun, and the smart butchers’ carts sink into the soft mud and red brick- dust, broken glass, and shavings; yet many of the houses are occupied, and the unconquerable London soot has already made some of the cheap art curtains look dingy. What strikes me about this depiction of urban sprawl, as in other similar depictions by George Gissing, is how images of construction are wedded, inevitably, with images of destruction and decay. The ‘ever increasing number of the genteel’ are at war with the past, and at war with the land that records that past, even as they are – in the social Darwinian view – at war with each other. Here, ‘unconquerable London soot’ is a synecdoche for the unconquerability of London itself, and it projects the commonly held late nineteenth-century fear that the overpopulation of cities in general and the metropolis in particular spelt disaster for the race and the nation. Upstairs in a back room in the silent house a pale strip of moonlight flickers over a dark streak on the floor, that trickles slowly from the pool at the bedside out under the door, making a second ghastly pool on the top step of the stairs — a thick sorghum red, blackening as it thickens, with a sickly serous border. Downstairs the woman sits in a chair with her arms hanging down. Her hands are crimson as if she has dipped them in dye. A string of blue beads lies on her lap, and she is fast asleep; and she smiles as she sleeps, for Susie is playing in a meadow, a great meadow crimson with poppies, and her blue eyes smile with glee, and her golden curls are poppy-crowned, and her little white feet twinkle as they dance, and her pinked-out grave frock flutters, and her tiny waxen hands scatter poppies, blood-red poppies, in handfuls over three open graves. Two everyday things that sit uneasily in the margins of the earlier parts of story emerge reconfigured by the sensational ending as somehow Gothically charged: the bricks that the workmen handle so laconically, upon which the narrator focuses obsessively, and the perambulators pushed by the happy new parents, who we witness ironically, from a distance. Egerton’s short story, through the poetic force of the miniature form it employs, thrusts these quotidian features of the cityscape together and insists that we recognise that, in urban sprawl, they are directly (and, perhaps, disturbingly) intertwined.